More and more attention is being paid to natural products chemistry. The number of recently discovered and described natural products is constantly increasing, leading to an abundance of detailed information in diverse specialist journals. The Roth Collection of Natural Products Data gives a clear overview of this development. It presents the data of approximately 75 selected natural products of plant origins in a concise and standardized form. The collection contains descriptions of the products with information on the physical and chemical properties, location, toxicology and risk potential. Complete spectroscopic and chromatographic data with clear information on measurement conditions and peaks round off the detailed depictions. With its illustrations of NMR, mass and IR spectra and its structural formulas, the collection is an important and stimulating reference work. Selected and commented references on each natural product facilitate the search for further information. Natural product chemists, pharmacists, biologists and toxicologists in research, industry and academia will soon find this reference work indispensable. 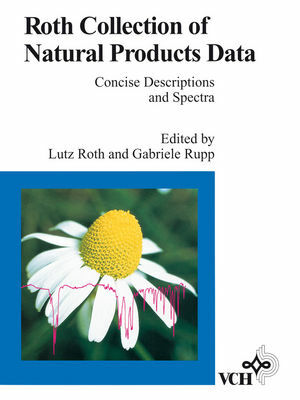 Lutz Roth and Gabriele Rupp are the authors of Roth Collection of Natural Products Data: Concise Descriptions and Spectra, published by Wiley. List of Contributors and Addresses. Abbreviations in IR and NMR Spectroscopy.